for more information on Stipe or to setup a stripe account you can go to the stripe website. Stripe payments can be integrated with Workforce in less than a minute. This will allow you to process credit card, american express and visa cards effortlessly from only 1.4% of the transaction in multiple different currencies including Dollars, Pounds and much more. Stripe payments as a company has been valued at over £10 billion pounds making it one of the largest and most succesfull payment providers in the world. Workforce.FM is a real-time management solution for field service & service management businesses. Our cloud based solution allows admin staff to manage and schedule jobs in real time to field workers. Field workers can access, manage, capture information and complete jobs using any Apple or Android mobile or tablet device. 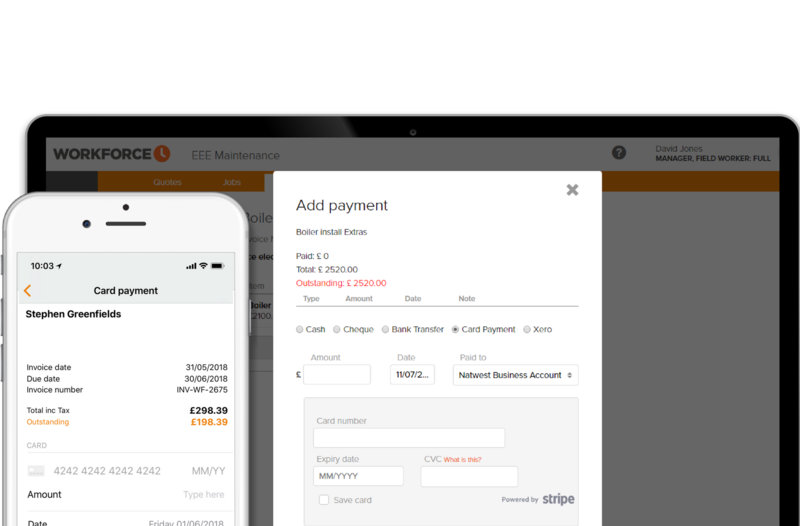 Connecting your Workforce account with Stripe payment will allow your office staff to take payments, as well as allow your fieldworkers to process card payment out on site. Rated People or MyBuilder; Which is the Best Choice for my Business? © 2016 WORKFORCE. ALL RIGHTS RESERVED.